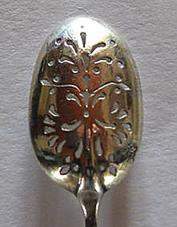 I have recently been made aware of misunderstandings in the minds of some collectors of English silver plate concerning the piercing of mote spoons which has led to the belief that these little spoons were not entirely English in origin and it would seem appropriate therefore to say a few words on this subject. 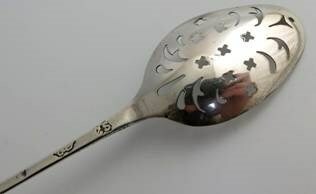 There is no evidence of the existence of mote spoons anywhere in the world until they appeared in London in the late 17th century when they were known as "long tea strainer spoons". Although they were in use in connection with tea drinking for about a century it has still not been established for certain how they were used, but what is known is that the original examples were utilitarian in design with nothing but simple holes drilled through their bowls thus allowing the straining which their name implied. By the turn of the century these simple holes had given way to quite decorative design and this was experimented with throughout the 18th century. 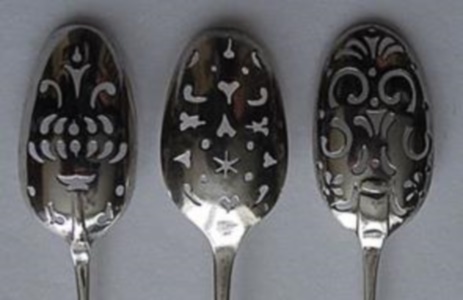 However to date no evidence has been discovered to suggest that any of this experimentation originated outside London although a few of these spoons were made in America and some may even have been made in Dublin (see note 1). 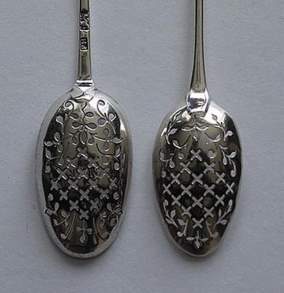 It seems likely that it was at the beginning of the 18th century that specialist piercers began this experimentation and early in the century mote spoons were produced which, although by different makers, exhibit identical piercing suggesting that not all makers did their own piercing. 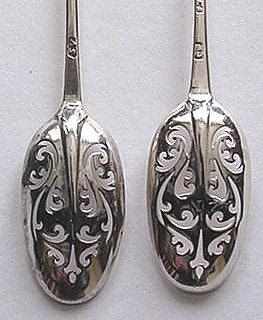 Fig I is of two mote spoons made between 1697 and 1720 by different makers and it will be seen that their piercing is not only identical but is of a very high quality indicating the work of a specialist. Examination of the patterns used on these early spoons shows that these patterns became established and were used fairly universally. 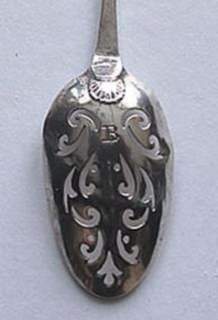 Fig II is of a mote spoon of about 1737 that exhibits very similar piercing, but not by a specialist, combined with the shell heel that had become popular by then. Both the quality of the piercing and its symmetry can indicate that the work was executed by a specialist but not all makers used the services of these specialists. Fig III is of two mote spoons that were produced in the Harache workshop and must be dated to about 1710. The quality of the piercing on these spoons is sufficiently good that it too could have been done by a specialist and the only reason for doubting this is that a foliate motif has been used that is peculiar to the Haraches. (note the engraved ‘stem’ leading to the leaf-like apertures on either side of the bowls particularly noticeable on the left hand spoon). This quality of workmanship can lead to the belief that specialist piercers have been used by makers when, in fact, they had developed their own expertise. On such occasions it is only by identifying a particular pattern of piercing with a particular maker that it can be established that a mote spoon was made in its entirety by one man. Fig IV is of two mote spoons of the mid 18th century made by Francis Harache which, like the earlier Harache examples, exhibit a foliate design and this is peculiar to Francis showing that he and he alone was responsible for these spoons. It is also possible to establish that a spoon was made in its entirety by one man, notwithstanding the outstanding quality of the workmanship, by the decorative features it exhibits. 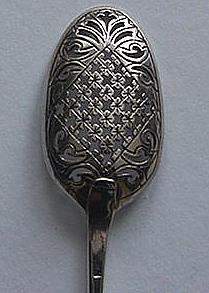 Fig V is of a spoon made by Samuel Key in about 1750 which has not only been pierced in the standard way with the crosslets that had by then become the norm but has been exquisitely engraved. This engraving is unlikely to have been the work of a specialist piercer although the man who made this spoon was undoubtedly a specialist! 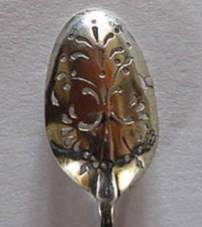 This quality of workmanship was not common to all mote spoon makers who did their own piercing and this can sometimes lead to a belief that a spoon is not English especially if the piercings are not of a standard form. Fig VI is of three mote spoons that are anything but standard and both the symmetry and quality of workmanship leave much to be desired. They are, nevertheless, all English mote spoons! This lack of standardisation can add considerably to the interest in collecting such spoons but there are pitfalls. Fig VII is of a spoon that I have written about before. Both the symmetry and the standard of workmanship are good showing that the piercer exercised a good deal of expertise and the actual patterns used are quite attractive. Beware however, do not be misled by these features for this spoon is a converted teaspoon and thus a fake so piercing alone cannot determine the authenticity of a mote spoon. 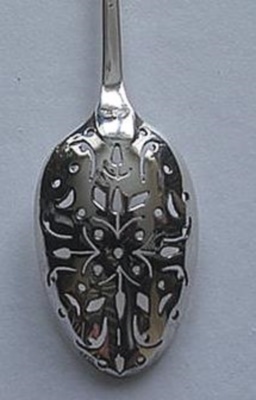 It will be seen from the foregoing that the piercing on a mote spoon is much more likely to indicate who made it, even if he remains unidentified, than it is to indicate where it was made. Notwithstanding the variable quality of the workmanship exhibited in the piercing of these spoons, the wide variety of design merely adds to the fascination of collecting them but one must always beware of fakes. In writing about mote spoons in the past I have stated that they were not common on the continent of Europe or in Scotland or Ireland. I have now been made aware that there are very rare examples of Irish mote spoons. Fig VIII.